Brno is the second largest city in the Czech Republic and the largest city in Moravia. The city is full of historical and cultural monuments. Most are located in the historic heart of the city. Brno is a town of interesting architecture from the Middle Ages to the present – modern architecture is represented mainly by functionalism. The city is ranked as the leading urbanized unit in Europe. Spilberk Castle is located at the top of a hill above the town. 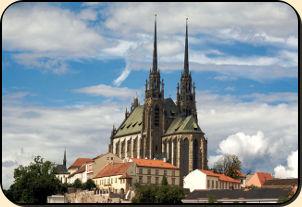 It was founded in the second half of the 13th century by the Czech king Přemysl Otakar II. The most famous part of the castle is the historic prison – casemates. The most famous Baroque monuments include the Holy Trinity Column on the Green Market or the Plaque Column on the Square of Liberty. You can also visit the church of St. Peter and Paul, the Capuchin crypt with mummies of monks or the world famous functionalist – Villa Tugendhat, which is a UNESCO World Heritage. The modern sight that is worth seeing is the Brno Astronomical Clock in the shape of a projectile with a clock machine inside, which releases every day at 11.00 am a ball that can be taken in memory. You will come across one almost rude curiosity at Church of St. James. If you look at the church from the south side, you will see a bare bottom at the top of the Gothic window. It is said that the clergy of St. Peters did not like those of St. James, and vice versa. So you can imagine how much tension there was when the two places of workship were being built. The St. Peters clergy had more money, but those of St. James had a better builder, who had gained more experience working abroad. The builder was quite a lad and was very popular not only on the building site, but also amongst the city burghers. The building work at St. Peters fell behind schedule and people began to say that St. James would be finished long before St. Peters. Therefore the St. Peters clergy, who were far more powerful, forced the stone mason to leave the St. James site. Before he left, however, he was allowed to complete the work he was doing on the Gothic window. All at St. James were thrilled when they saw how the stone mason had revenged himself on the clergy of St. Peters. And this sweet revenge took the form of a bare bottom sticking out at those that had forced him out of the city. Come with us to the second largest city in Czech Republic in your very own limousine.